OMNIgene®•GUT is an all-in-one system for easy self-collection and stabilization of microbial DNA from feces for gut microbiome profiling. Complete donor user instructions for this product are available here. Accurate measurement of a host microbiome requires standardization in methods of sample collection, stabilization, handling and extraction. Pre-analytical and analytical factors contribute to microbiome variability and have a large impact on accuracy and reproducibility of microbiome profiling. OMNIgene•GUT collection, stabilization and homogenization technology effectively mitigates environmental impacts. Sample stabilization and DNA extraction method are the most important pre-analytical processes to assess when establishing SOPs. Regards to stabilization methods, OMNIgene•GUT showed the lowest dissimilarity when compared to fresh, immediately extracted samples. Bias introduced by the extraction method could cause inappropriate data interpretation, increased signal to noise ratio and limited reproducibility. OMNIgene•GUT enables easy self-collection and high return rates for donors with dysbiosis. The in vivo microbiome profile is accurately maintained in OMNIgene•GUT samples collected from IBD patients. Microbiome profiles of IBD patients are preserved during ambient transport when collected into OMNIgene•GUT. OMNIgene•GUT devices are not restricted to bacteriome analysis but are also suitable for the study of the less abundant human gut mycobiome and virome. Preliminary data demonstrate that OMNIgene•GUT can accurately capture and stabilize both fungal and viral species. Analysis of fungal species in OMNIgene•GUT samples by ITS sequencing revealed that primer selection is paramount for accurate taxonomic identification, with ITS-2 giving optimal species identification. 1. What is the gut microbiome? A human body is made up of all kinds of different cells. Some of these cells are human cells such as skin cells or blood cells. We are also host to trillions of microscopic microbial cells which include bacteria, archaea, fungi, protists and viruses. This group of non-human cells within our bodies is referred to as the human microbiome and they have their own unique set of genes. The gut microbiome refers to the microbes living in our gastrointestinal tract. It is the largest and most diverse microbial community in the human body and scientists are discovering this community plays an important role in our health. We get most of the microbes in our gut microbiome from other humans. Babies first encounter microbes through the birth canal, their mother’s skin, breast milk and other individuals who touch them. As babies grow, they encounter microbes in the environment, other people, plants and animals. We also ingest microbes from the food we eat. 3. What does the gut microbiome do? The microbes in your gut are actually helping to keep you healthy. Your gut microbiome provides about 10% of your daily energy supply because they can breakdown things we eat that we can’t digest on our own. Your gut microbes are also responsible for producing vitamins like biotin and vitamin K and producing hormones that tell your body whether or not to store fat. They also help to support your immune system and to protect you from disease. 4. Does everyone have a similar gut microbiome? Each person’s gut microbiome is a reflection of their diet, lifestyle, and complete social history so there can be quite a bit of variation from one person’s gut microbiome to the next. Even though over 1000 different bacterial species can be part of the gut microbiome, each of us “only” has 150 to 170 different species in our own gut microbiomes. People who are related or live together tend to have similar gut microbiomes. Over time, your gut microbiome can change if you alter your diet, take antibiotics or visit a new environment. How things like diet, lifestyle and medication change the gut microbiome is something scientists are only beginning to understand. 5. What is the relationship between the gut microbiome, health and disease? Researchers are discovering that the gut microbiome might be an important factor in a wide range of health issues like obesity, asthma, diabetes, cancer, autoimmune disorders and heart disease. There are also indications that the gut microbiome may affect sleep patterns, mood, anxiety and other behaviors. Your gut microbiome can also affect how you respond to certain drugs. Research is deepening our understanding of the role the gut microbiome plays in many different aspects of human health. 6. Why is it important to collect a great sample to study your gut microbiome? Researchers need to get an accurate representation of you and your microbiome. Unfortunately, your microbiome profile changes when your sample is not carefully handled and is exposed to unfavorable environmental conditions during collection and shipping. An inaccurate microbiome profile would give researchers wrong information that could result in erroneous conclusions. In order to avoid this problem, it is essential to protect your sample from the very beginning. 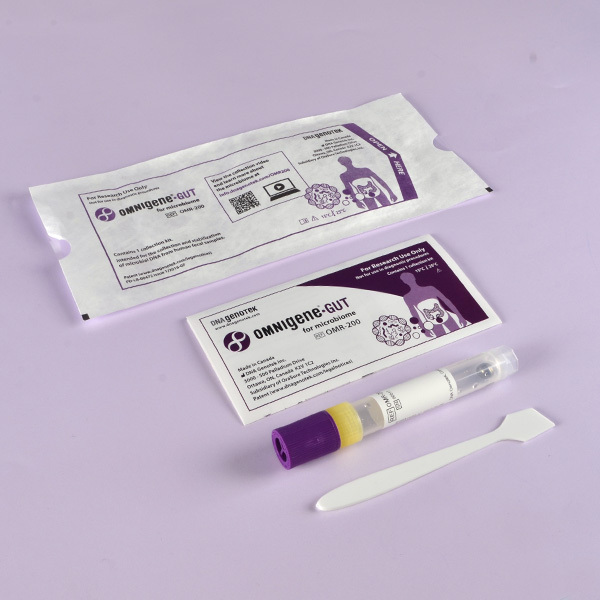 The OMNIgene•GUT collection kit will keep your sample protected, ensuring an accurate representation of your microbiome. Reid, Ann and Greene, Shannon. Human Microbiome FAQ. The American Academy of Microbiology. 2013. Selkrig J, Wong P, Zhang X, Pettersson S. Metabolic tinkering by the gut microbiome: Implications for brain development and function. Gut Microbes 2014 Mar 31; 5 (3). Yukihiro Furusawa, Yuuki Obata, Shinji Fukuda, Takaho A. Endo, Gako Nakato, et al. Commensal microbe-derived butyrate induces the differentiation of colonic regulatory T cells. Nature, 2013 DOI: 10.1038/nature 12721. Gut Microbiota Worlwatch. Everything you always wanted to know about the Gut microbiota. Public Information Service from European Society of Neurogastroenterology and Motility. http://www.gutmicrobiotawatch.org/gut-microbiota-info/. Accessed June 3 2014. Lawrence, David A, et al. Diet rapidly and reproducibly alters the human gut microbiome. Nature. 505, 559-563. 11 December 2013. Some DNA Genotek products may not be available in all geographic regions. Overcoming challenges in DNA sample collection. Transport and store stabilized DNA at ambient temperature – no cold chain required.